In school my lunches usually consisted of a brown bag/lunch box lunch. If I was lucky it meant mom made it - not so lucky my dad made it and my pb&j was more like a pb&j puddle with soggy bread in a baggy. 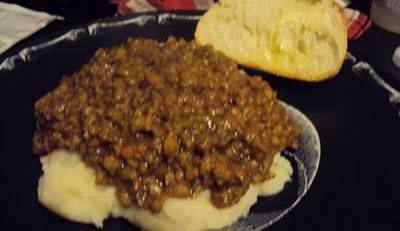 The occasions I did eat a cafeteria meal one thing stuck out over the years and that was hamburger gravy with mashed potatoes. My mom said this was a fave of hers too and Matt never had it - so ya know I had to veganize this classic! Prepare the gravey mix according to instructions adding an extra 1/4 cup water. Brown crumbles in oil. When the gravy is done add it to the crumbles in the pan on low heat. Make the mashed potatoes via the box instructions then stir in sour cream. Place a big glob of mashed potatoes on your plate, my a dent and fill with hamburger gravy and enjoy! It came pretty close to what I remember from grade school! *I think that a boxed mix makes the dish more authentic tasting. If you want try making mashed potatoes from scratch - it is up to you!